EOS 690 Multi Strength Cleaner is a new proprietary cleaner for final cleaning of masonry. In addition to removing excess mortar and smudges EOS 690 Multi Strength Cleaner is highly effective for removing efflorescence, severe calcium carbonate build-up, lime deposits, atmospheric carbon, dirt and metal salt stains from clay brick, concrete masonry and limestone. EOS 690 Multi Strength Cleaner can be used on new masonry or restoration / renovation applications. For best results masonry surfaces should be cleaned within 30 days of installation. 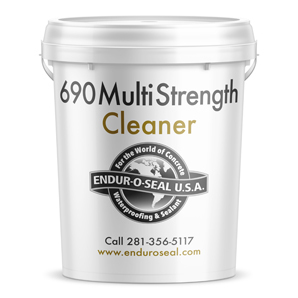 EOS 690 Multi Strength Cleaner is shipped in concentrate form and the proper dilution should be determined before using, consult Endur-O-Seal for assistance.